Then i will have 48-3=45 free disks for data on each filer. 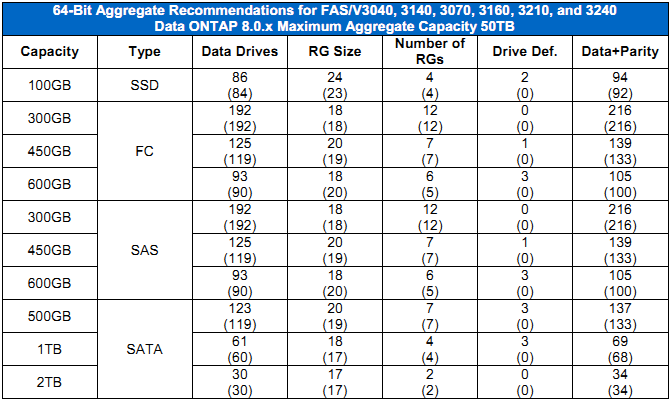 First, on website i checked that 3160 supports maximum 28 disks per aggregate (http://www.netapp.com/us/products/storage-systems/fas3100/fas3100-tech-specs.html). Is this true also with ontap 8.x? From the link i cannot see ontap version, can i assign more disks per aggregate with 8.x version on this model? And if i can, what do you think of an idea to create 2 large aggregates (one per filer)? I would get more space, but will this overload CPU's and cache on filers? in raid dp. Is raid group size of 15 good for this? Actually with 32-bit aggregates (pre-ONTAP 8 & ONTAP 8.x as well), you can have up to 33x 600GB drives in one aggregate. With 64-bit aggregates (ONTAP 8.x), you can have up to 105x 600GB drives in a single aggregate on FAS3160. You've almost answered your own question! There is no need for a dedicated root aggregate in my opinion. You do need, however, spare disks, ideally 2 per controller.